Thread here. Current version is 1.11. Seems this game is intended to be played at 50Hz, not 60. Last edited by Despatche on Tue Apr 09, 2019 10:47 am, edited 8 times in total. Once again, 5 minute modes scare me a lot. It actually makes no real difference. The game detects the speed of the system it's running on and makes sure it runs always at 50Hz. Naturally, this means that it's just a little bit smoother if the system's speed is 50Hz natively, because on a 60Hz system it stops for one frame every sixth frame which results in a slight stutter. (Hardly noticeable in the heat of battle, though.) Hence the recommendation to run the game at 50Hz if possible. It will work perfectly fine either way, though. Yeah, I noticed that, so the bit in the readme surprised me, but now it makes more sense. I can count on you to actually account for things like that! Might as well throw in my own personal bests. Don't include them in the ranking if you feel that I have an unfair advantage. V1.0 and v1.1 are identical in regards to scoring, so it's not really necessary to state the version. V1.1 just adds a fix to a glitch that appears on systems/emulators with not enough SRAM. Here's my best 2min score so far. I haven't really played the 5 minutes mode yet, maybe I should try it more seriously. Current version is now 1.11. 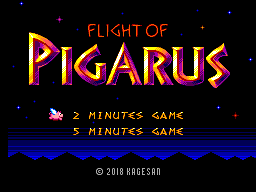 Again, this version only fixes a minor cosmetic glitch on the highscore results screen. The game itself remains unchanged.